For many of us, back to school time means a return to a normal school year schedule. Maybe it’s the inner teacher in me, but I always want to start fall off fresh, with new goals and new projects. So I’ve made a few changes to my blog and have a few more exciting announcements to make about what’s in store for fall. 1) I’ve added a new Blog Roll section to my site. I’ve included several bloggers whose writing I regularly check out and always respect. Who have I missed? 3) The HerStories Project, my collaborative blog about friendship and motherhood with Stephanie Sprenger of Mommy, For Real, is now open again for submissions. We’ve taken a bit of hiatus this summer from posting friendship essay regularly. But we’re back now and looking to hear and feature your stories about friendship. Today’s HerStories post is from Stephanie herself, talking about how she and her family are dealing with her daughter’s best friend’s moving away. Check out Stephanie’s piece and share your own experiences with moving or coping with the move of a close friend. 4) Stephanie and I are also promoting a new project with Shasta Nelson of GirlfriendCircles. It’s a course about friendship! This course was created by 13 of the leading experts (including me!) 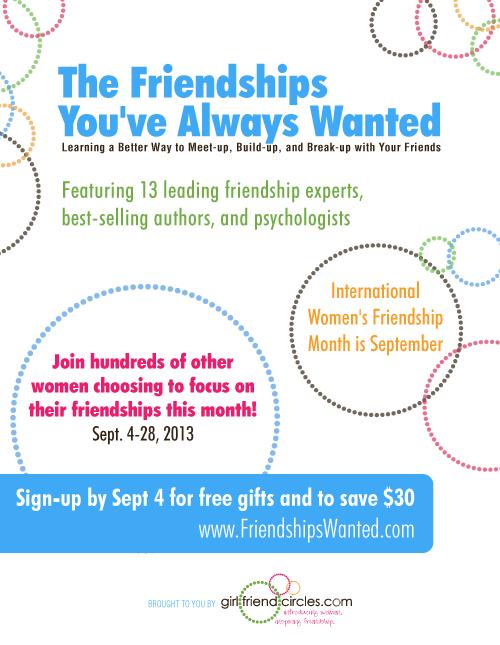 on friendship and healthy relationship so that this September hundreds of women can all commit together to choosing friendships as their theme for the month! The interviews include New York Times best-selling authors, psychologists, sociologists, professors, and all kinds of amazing teachers who have come together to inspire you, teach you, and challenge you to take your friendships to the next level! I was honored to be a part of it since there really aren’t very many ways for women to lean into learning more about their friendships with a community of women! The course is hosted by a woman I so admire for her work in female friendships– Shasta Nelson is the CEO of GirlFriendCircles.com (a female friendship matching website) and the author of Friendships Don’t Just Happen! She’s been on the Today Show, Katie Couric’s show, Fox News, and most recently interviewed for an article in this summer’s Women’s Health magazine. Join me and 100’s of women this Friendship Month as we all commit to doing what it takes to surround ourselves with the community we know we want! Our lives change so much that we are losing half our friends every 7 years. And it’s our responsibility to be replenishing those relationships so that we have the friendships around us that make us happy. This program starts tomorrow on Sept. 4 with a LIVE call! For everyone who signs up before that day you’ll be entered 5 times in a raffle for a free airline trip to visit a girlfriend somewhere in the U.S., plus you’ll get a free copy of Shasta Nelson’s book Friendships Don’t Just Happen! Sign up today! And stay tuned for tomorrow’s book club announcement! And I’d love to hear your suggestions for blogs and for books that I should feature on my new pages…. Wow you are busy!! I’m going to check out your book review section right now! Congratulations on all your new projects! Whats up, I’ve joined to your blog page post here: http://www.tongfengzhengzhuang.net/contact-us/. This approach is well suited for use in your own home by means from the implementation of weight loss hypnosis CD programs. Evaluating your own needs is the starting point to long-term weight-loss success. A selection of weight reduction pills about the market really should not be utilized by people who have cardiovascular disorders or by individuals who have particular medications. After an individual has had their procedure and healed from that they also needs to talk which has a health care professional to ensure that they are able to produce a regimen of standard exercise. It might come simple to others but many people have failed miserably.